This article was posted on 10th May 2017. Our ever increasing busy and hectic lives have organically paved the desire to retreat to nature in our homes and with Pantone declaring ‘Greenery’ as their colour of 2017 never before has adding a splash of green in your home been more accessible. A plethora of jewel toned home accessories, beautiful furniture and paint colours have had interiors gurus tripping over their ivy and ferns to show us how to breathe this freshest of colours into our environments. With heritage connotations and an understated, yet bold quality, the addition of green in your home is the perfect way to bring your interior into 2017 without the brashness many “faddish” colours risk. 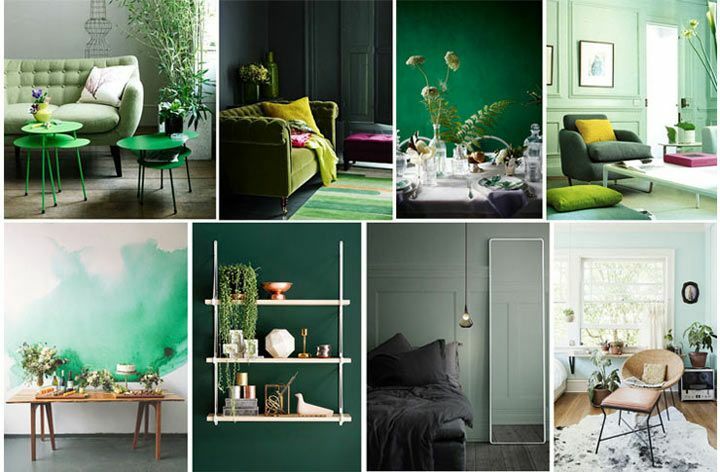 If you’re feeling inspired, go to town by painting your walls sophisticated shades of green - our personal favourites are Little Greene’s Eau-De-Nil and Sage Green, or head to the ‘dark side’ with Farrow & Ball’s Studio Green. If you still need a little tempting, green looks incredible with the other colour of the moment – blush pink and pops of warm metallics – gold, copper and brass. With white, neutral shades and natural wood accents being the basis for Scandi-led interiors, which have been at the forefront of interior design for the past few years, there couldn’t be a more complimentary tone to start incorporating into your interior. Dark and dusky green hues bring a sense of calm and subtle sophistication making the colour du jour the ideal choice for a bedroom. 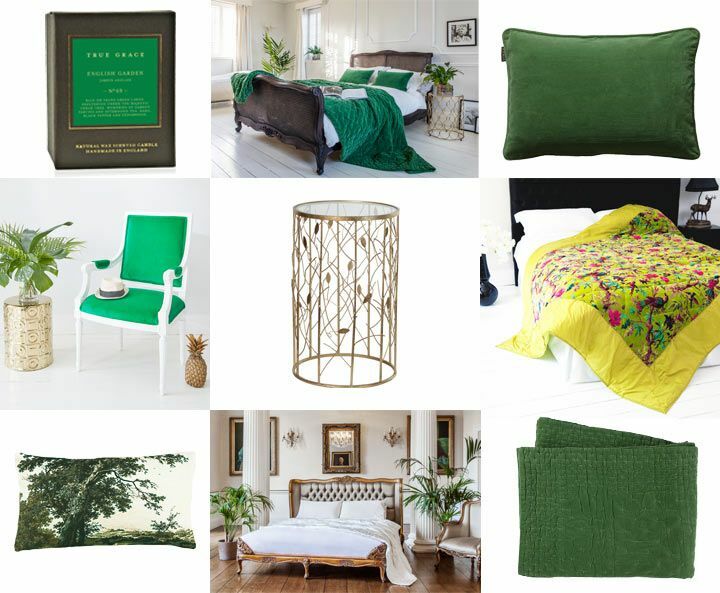 Top Row: English Garden Scented Candle, Charcoal Rattan Bed, Dewdrops Gold Side Table, Green Velvet Bedspread and Plushious Green velvet Cushion. Middle Row: Green Velvet French Chair, Circles and Squares Gold Side Table, Leaf Motif Side Table and Trippy Granny Bedspread. Bottom Row: Westonbirt Cushion, Versailles Gold and Silk Bed and Green Velvet Throw. But if that is a little too literal, the green movement can be interpreted through plants; removing toxins and pollution, plants are therefore a wonderful way to help create a relaxing, detoxed home environment, while adding pattern, colour and texture. Living walls have become popular statements in many top hotels and retail shop displays - get the look, on a slightly smaller but no less beautiful scale with terrariums, miniature landscapes with moss, plants, succulents, cacti and even in some cases crystals. A fabulous pairing who have truly embraced the trend for all things living in the home are Igor Josifovic (one of our fellow Amara Interior Blog Award 2014 winners for his Happy Interior Blog) and Judith de Graaff. 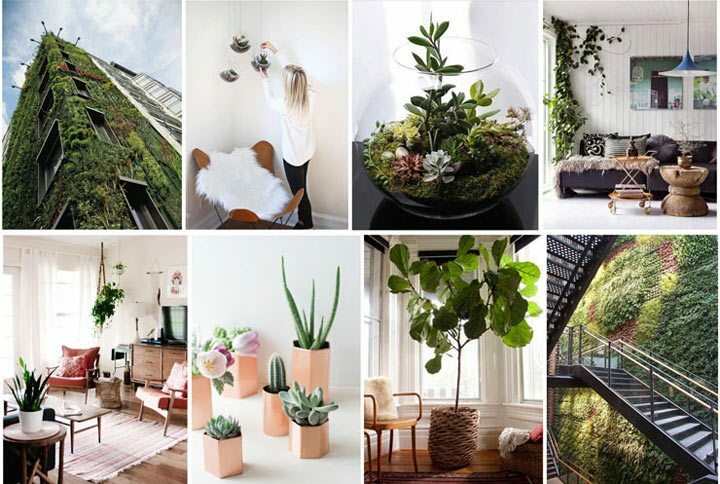 They created an inspirational online community - Urban Jungle Bloggers, dedicated to all things green! For amazing ideas, beautiful plant pictures and infinite blogs on the subject head over to Urban Jungle Bloggers.